US Orthodox Jewish group praises NY Governor's announcement of $25 million security grant for religious schools. With anti-Semitic incidents increasing around the United Statesand in particular a rising number of hate crimes across New York State, Governor Andrew Cuomo called together leaders from across the Jewish community and other faith based communities for a round table discussion at the Museum of Jewish Heritage on Thursday. Despite the haste with which the gathering was called, over 100 leaders attended, including Agudath Israel of America representatives Rabbi Chaim Dovid Zwiebel, executive vice president; Shlomo Werdiger, chairman of the Board of Trustees; Rabbi Shmuel Lefkowitz, vice president for community affairs; Mr. Chaskel Bennett and Mr. Leon Goldenberg, members of the Board of Trustees and leaders of the organization's Government Affairs Committee. The Governor announced that he will be offering a $5,000 reward for information leading to an arrest and conviction for a hate crime, and that he will be asking the legislature for $25 million to increase security funding for religious schools. 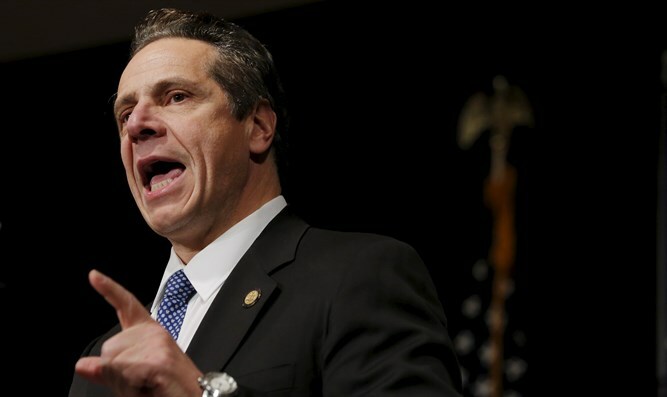 Agudath Israel of America, representing US Orthodox Jewish communities, praised "this important announcement by Governor Cuomo and is gratified that the Governor is making this security funding specifically available to religious schools. Increased security funding has been and continues to be a top legislative priority for the Jewish community, and Agudath Israel has played a major role in advocating for increased funding for yeshivas over the past few years." Rabbi Zwiebel noted that the Governor's initiative is particularly timely at this time, since the organization is gearing up for an intense advocacy effort in Albany over the course of the next month, when the state's budget for the new fiscal year is being finalized. Continued Rabbi Zwiebel, "this funding is extremely important. These are dangerous times and we need to harden our institutions. This special allocation will help us do so." Governor Cuomo's statements about anti-Semitism were also applauded by Mr. Werdiger. "While the Governor's uncompromising stance on anti-Semitism is hardly surprising, as he has always distinguished himself as a friend of our people, it is nonetheless reassuring to hear him speak out so forcefully about the rash of anti-Semitic incidents we have recently endured. His voice, and his actions, are very much appreciated." Concluded Mr. Bennett, "the Governor is the highest ranking elected official in this state. He has put his office and prestige behind a tangible proposal to protect religious institutions. He is a very powerful ally to have in this crucial battle, and we are deeply grateful for his leadership."